Paperback, 6.75 x 9.5 in. / 208 pgs / 170 color. Edited by Michael Hering, Andres Lepik, Bernhard Maaz, Angelika Nollert. Text by Nike Bätzner, Friedrich von Borries, et al. 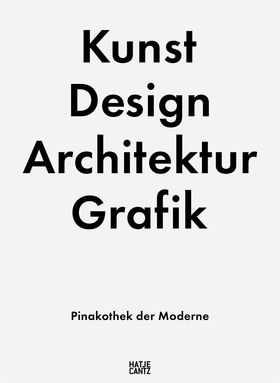 In 2002, four museums moved into the newly constructed Pinakothek der Moderne, thus founding one of the largest institutions of 20th- and 21st-century art and culture in the world. To celebrate their 50th anniversary, the Architekturmuseum der Technischen Universität München (Architecture Museum at the Munich Technical University), the Bayerische Staatsgemäldesammlungen (Bavarian State Collection of Paintings), Die Neue Sammlung – The Design Museum (The New Collection – The Design Museum) and the Staatliche Graphische Sammlung München (State Collection of Prints, Munich) take readers on an interdisciplinary tour through 200 collection highlights in architecture, visual and applied arts, prints and design. With eight essays on key developments in the decades between 1895 and 2016, this book offers a glimpse into modernism’s cultural history. FORMAT: Pbk, 6.75 x 9.5 in. / 208 pgs / 170 color.